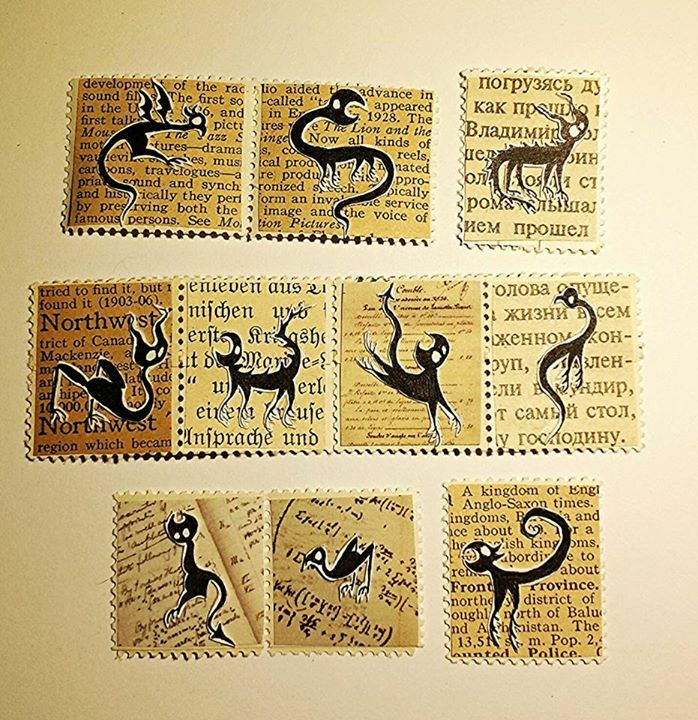 The lovely Britta (of JaguarSnail) has found yet another potential faux postage perforation solution for us to try and I, for one, am sold! While rummaging in a junk/antique shop recently Britta came across a pair of rusty, slightly odd-looking scissors with teeth on one side, where the blade would normally be. When she asked what they were for, she was told they were thinning shears, used in hairdressing. Who knew?! (Not us, but probably many other people in the world…) Anyway, I tried out Britta’s shears and they did indeed make neat-if-square-ish perforations which tore off nicely, so I immediately ordered a cheap pair of (new!) thinning shears to try for myself. 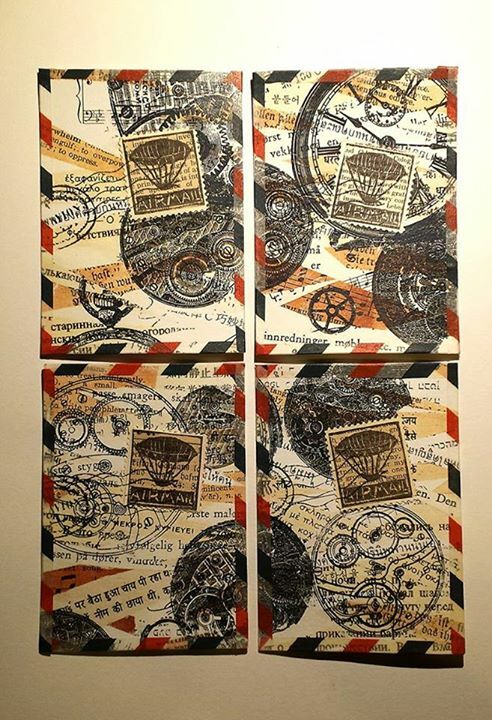 I’ve just made a new series of artistamps, printed on self-adhesive label paper, using my most recent postage stamp collages as background images. Here I’ve done a comparison test, first using a serrated pattern tracing wheel to tear off a stamp, and second using the thinning shears (not shown to scale!). The auto-separation of the paper after using the shears means that rather than pre-perforating a whole sheet of stamps to tear off as needed, I will be cutting off one stamp at a time, but I like the clean edging so much, I’m pretty sure I can live with that compromise! 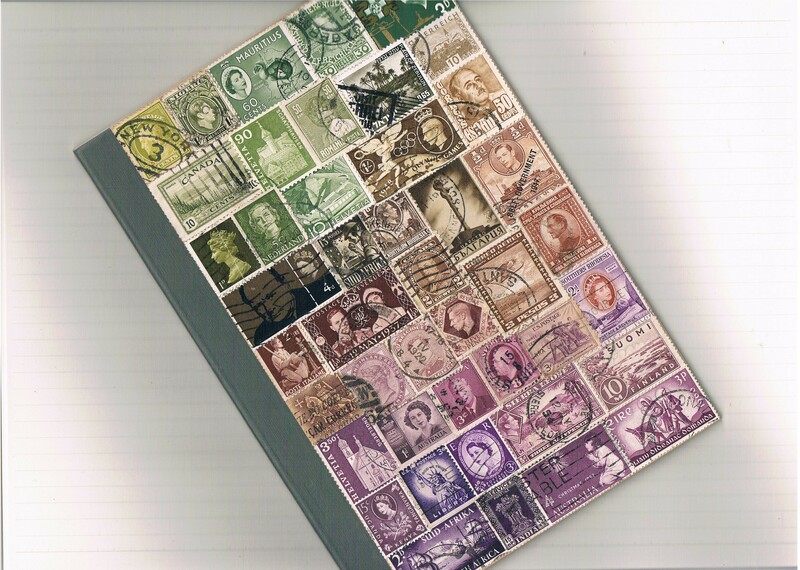 I designed the sheet of artistamps from notebook covers collaged in July. This is my first notebook collage of August in a combination of some of my favourite colours: an imaginary landscape which only narrowly missed the window of joining the artistamps above! Check out the TangleStore listing for more details. 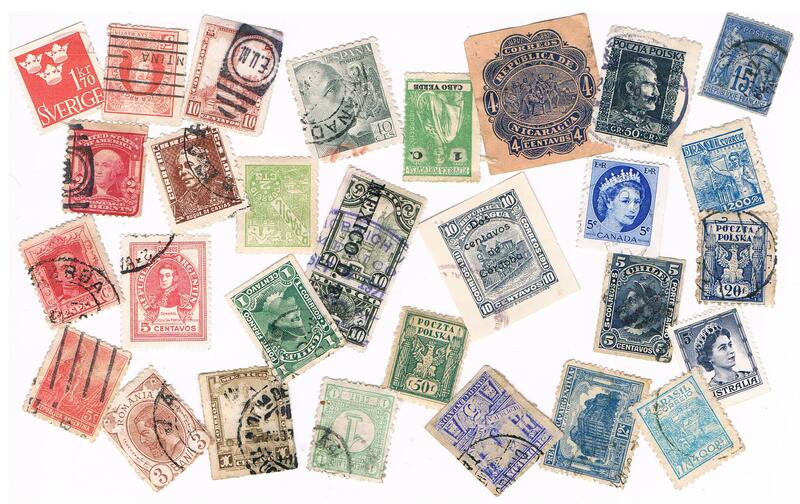 For more info about faux postage/artistamps, please see my Faux Postage Q & A page, plus all of these previous posts! 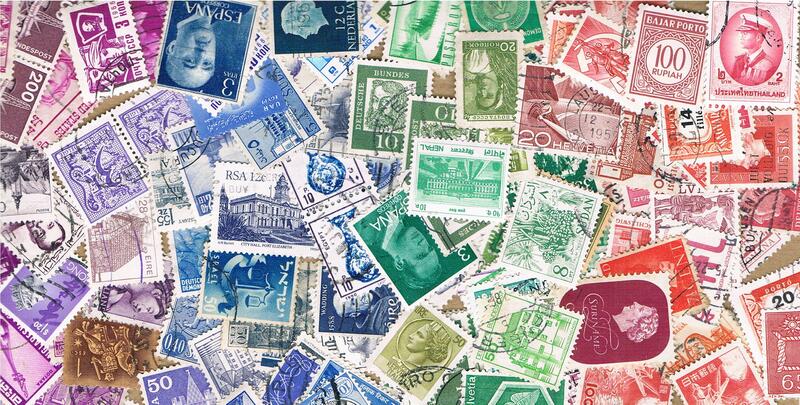 Oh, the trials & tribulations of faux postage perforation! Well, today I bring you a potential solution, as discovered by Laura Werger of Demon Kitty Designs. Thanks to Laura for sharing this great tip & solution! You can see more examples of her work in the Demon Kitty Etsy Store, and also on her Facebook page. My little sidetrack regarding perfection & fir trees the other day came about while I was browsing for Christmas card ideas. But for once, I have actually managed to make some Christmas cards before December (even better, before Christmas Eve!). They really emphasise for me the magical (,perhaps a little old-fashioned) but natural aspect of Christmas that can be overlooked amidst the swathes of red & green & gold & glitter of commercial festivities. In fact, only one of the quotations includes a specific mention of Christmas, so if you prefer to celebrate a non-denominational or pagan or ‘other’ seasonal solstice festival, they are suitable for almost all occasions. Click here for the original Andersen Little Fir Tree fairy tale. 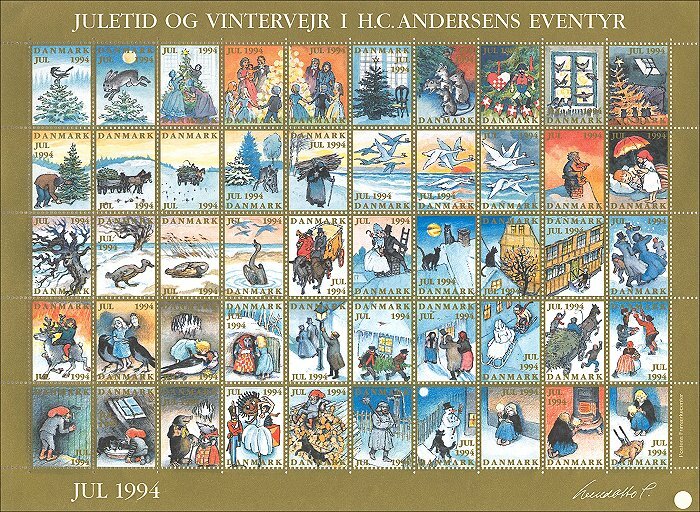 Click here for a gallery of & further information about Denmark’s tradition of Christmas Seals – this site is fascinating & well worth a visit! But what if Little Red Riding Hood is not necessarily the innocent heroine of times gone by? What if she is a little older, a little cannier, a little altogether sneakier? In our new Enchanted Times report, a warrant has been issued for the arrest of itinerant seamstress Ms Scarlet Hudd, after a Mr. B. B. Wolf claims to have been stitched up in every sense of the word… Who do you believe? Read the brand new issue of Enchanted Times Mini & make up your own mind! 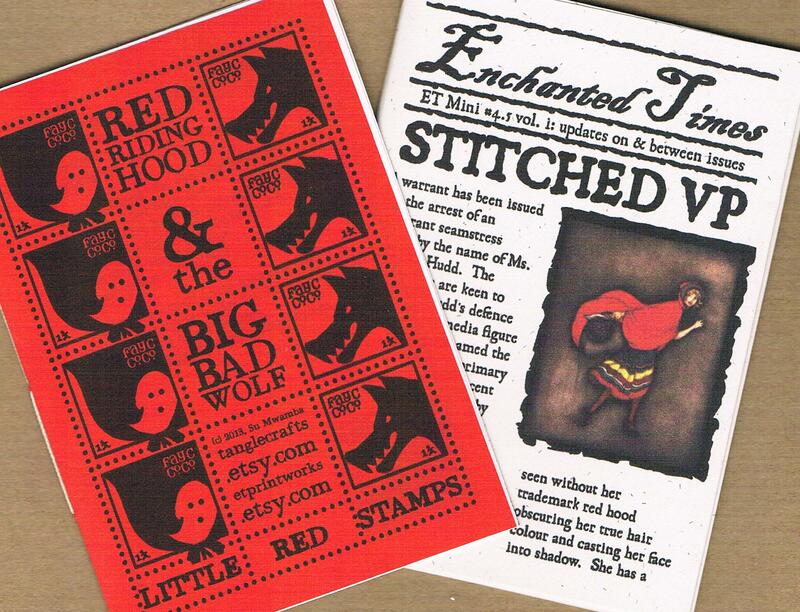 A complementary Little Red Stamp Booklet has also been issued by the Fast-As-You-Can Courier Company (staffed entirely by rehabilitated Gingerbread Men), featuring genuine FAYC (lick & stick) stamps and further variations on the Red Riding theme. Hop on over to the Enchanted Times blog for an exclusive online interview with the aforementioned Mr. B. B. Wolf, who offers his own views on the subject as well as additional points regarding lupine discrimination. 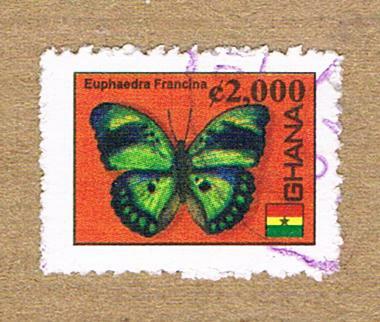 Since discovering the imperfect perforations of the real stamp from Ghana, I have felt far less of a compulsion to achieve perfect perforations on my faux postage stamps. Nonetheless, perforations are still an integral part of the artistamp process, so my experiments have continued. 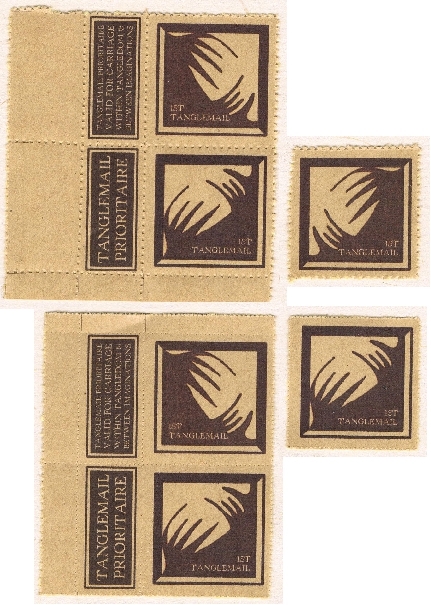 Due to the self-adhesive backing on this kraft paper, the perforating blades have 3 layers (paper, adhesive, peel-off backing) to penetrate rather than the standard single thickness of other papers. It therefore took extra pressure for the pounce wheel to pierce through the paper. 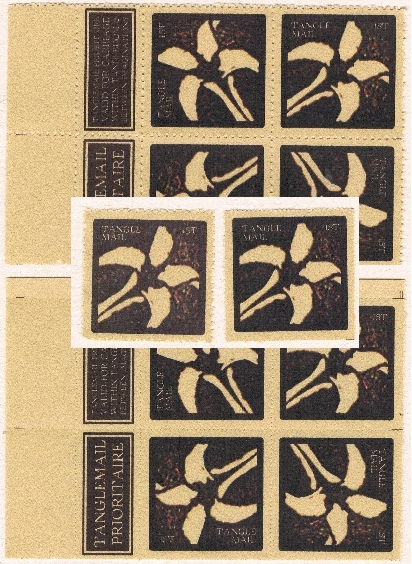 The pattern wheel perforated with far greater ease and created a far more convincing visual effect before the mini sheet of stamps was separated. 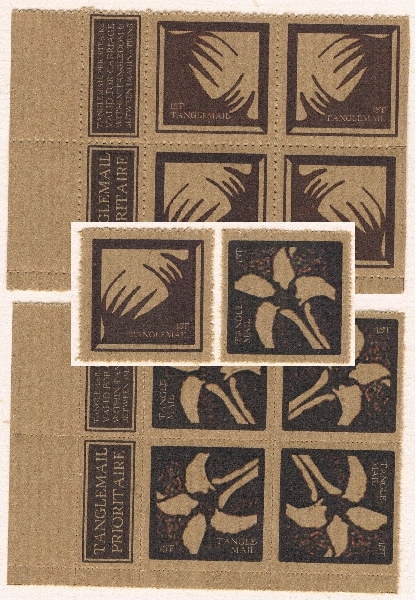 The backing paper accentuates the ‘fluff’ around the edges when separated but both methods of perforation were successful. 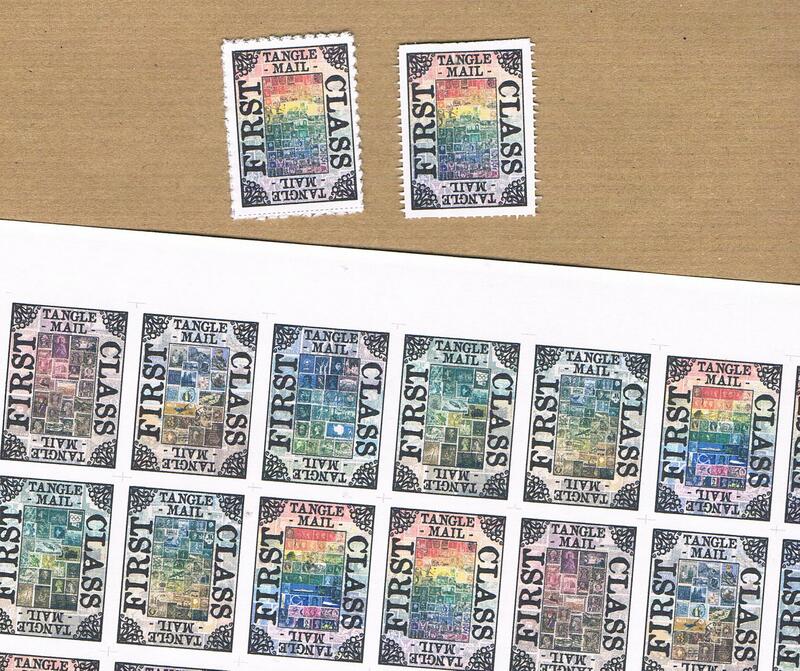 I did prefer the appearance of the stamps with the larger, pattern wheel perforations, in both sheet & individual form. This gummed paper is very thin compared with Paper #1 and is therefore far easier to perforate by any method. The paper isn’t quite as thick/shiny as the coloured gummed paper I remember from school, but prints & perforates well which more than compensates! I found I actually preferred the finer, pounce wheel perforations on this paper. The pattern wheeled mini sheet was pierced deeper than Paper #1 making the holes appear more ‘obvious’ but not as round or clean, whereas the pounce wheeled sheet separated very cleanly due to the closer perforations. 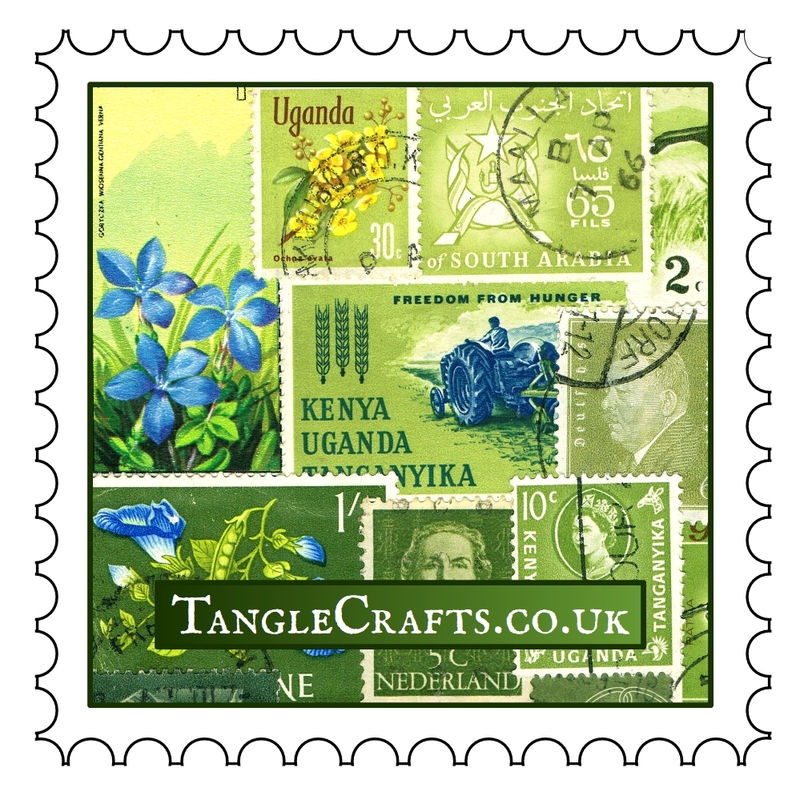 The edges are still clearly serrated, although the appearance is definitely not the same as a real perforated stamp. Thicker than Paper #2 but obviously not as thick as Paper #1, Paper #3 perforated cleanly with both wheels, but I preferred the appearance of the serrated pattern wheel, this time. Both perforation types resulted in ‘fluffy’ edges, but this was due to the fibrous nature of the kraft paper rather than perforation type or spacing. I wasn’t really keen on either of the separated stamps.